With constant additions to SEND reforms, Gareth D Morewood lists the top things SENCOs need to be aware of. After delivering keynote addresses and workshops at a few SENCO conferences this last week I feel it is useful to give a quick update on some of the key issues regarding SEND implementation and reform. In reality, after four different SENCO conferences and events over the last two weeks and chatting with numerous parents/carers, much of what is heralded as successful is not mirrored by SENCo colleagues and families on the ground. It is useful to note that during the last month all local authorities have received a reminder about deadlines for transfer reviews, specifically for all children and young people with statements of SEN transferring to a new school by 15 February 2016.
ensure a timetable for when the final EHC Plan will be completed. In addition it is very important that SENCos remember that LDAs need to transfer to EHCPs by 1st September this year. The Education Funding Agency will not fund LDAs from September, so now is a timely reminder to ensure LAs are leading the transition. There is detailed information about the EFA and high needs for 19-25 year olds available and this excellent blog post from @aspiedelazouch on the DfE’s new SEND funding consultation is recommended – although I will warn you (as Barney does) it isn’t the most exciting read ever, but very important. £2.3 million for Parent Carer Forums, which bring parents together to provide invaluable support and advice for families. Ultimately for schools this doesn’t mean much directly in the short-term, however the extension of Independent Supporter contracts and additional support for Parent Carer Forums will, hopefully assist more families at this time of significant need. It remains to be seen what direct impact these contracts will have for schools. However, having been involved with the KIDS Personal Budget project from a previous round, I can speak from direct experience that depending upon who is awarded the contract and the specific remit of the work will see a range of possible outcomes. I think this is, in reality, one for the ‘watch this space’ area! These new Joint Targeted Area Inspections of services for vulnerable children and young people (JTAI) will involve CQC, Ofsted, Her Majesty’s Inspectorate of Constabulary (HMIC) and Her Majesty’s Inspectorate of Probation (HMIP). All four inspectorates will jointly assess how local authorities, the police, health, probation and youth offending services are working together in an area to identify, support and protect vulnerable children and young people. These inspections are expected to begin in May 2016. It is important to note that while inspectors will visit providers, such as schools and colleges or other provision, as part of assessing the effectiveness of the local area, these providers will not be under inspection as they are subject to separate institutional inspection arrangements in line with statutory and regulatory duties. However, these visits to providers will be used to inform inspectors’ assessment of how all these providers, and other agencies, work collaboratively to improve the life chances of children and young people with special educational needs and/or disabilities.' Christopher Robertson, Senco-forum, 2016. It is also worth noting the Parent Carer Forum Survey (Nov 2015) results prove interesting reading. Forums report that only 14% of children, and 18% of young people are either fully or largely involved in making decisions about their own SEND provision. Only 2% of forums feel that further education providers are fully reshaping SEND provision in light of the new Code of Practice; a further 26% are doing this to some extent. 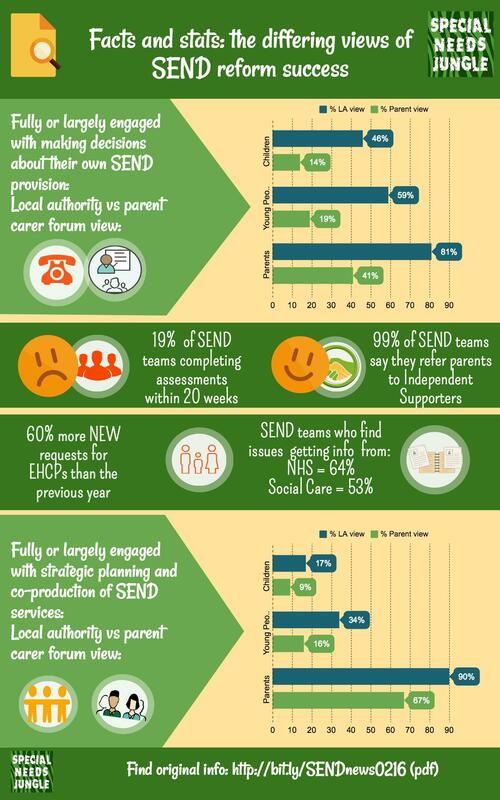 14% of forums are very, or extremely confident that their local authority will complete the Transition Review process from statements and LDAs to EHCPs between 1st September 2015 and 31st August 2016. 43% are not at all, or not very confident that this will happen. Very low numbers of forums report that their short breaks statement or local offer meet the requirement to contain up to date information on eligibility criteria, or how services meet the needs of parent carers very well, or extremely well, just 14% and 13% respectively. There is a handy infographic from Special Needs Jungle about these ‘facts & stats’ in addition to a more detailed blog post, which is definitely worth a read. Even being a positive guy, it is tough at the moment. 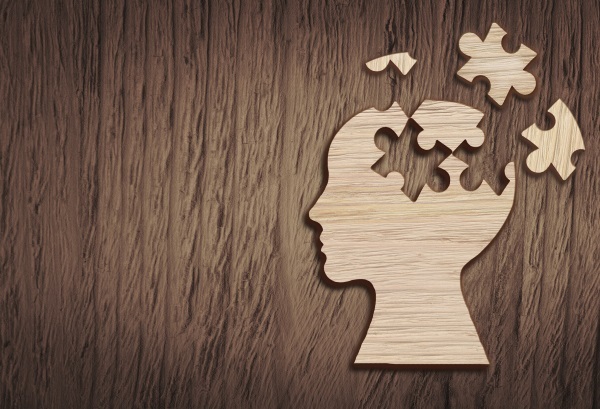 However it is important to keep provision child-centred, ensure parents/carers are fully engaged with all elements of provision and support and that we ensure a focus on facts and the law, not misinformation and spurious guidance.